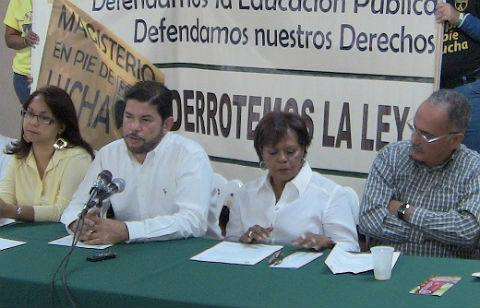 The Teachers Federation of Puerto Rico (FMPR) denounced in a press conference today the firing by the government of 11 members of the Executive Committee of their union and the revocation of those teachers’ licenses. “This unprecedented, brutally repressive measure is intended to strike a blow against the leadership of the Federation and to intimidate teachers from fighting the fascistic plans of the Fortuño government to privatize schools and rob the Teachers’ Retirement System,” said the president of the Teachers Federation of Puerto Rico, Rafael Feliciano Hernández. The 11 teachers, who were sanctioned, worked for over 20 years and three of them have more than thirty (30) years of teaching experience. “They enjoy great prestige in their school communities and have always distinguished themselves as formidably dedicated fighters for the rights of teachers and public education,” said Feliciano, who teaches in the Cayey School District. “The Executive Committee members knew that they could face the capricious and repressive rage of the Secretary, as the disciplinary hearings in the Department of Education, are, in general, a firing squad.” Feliciano stated. “The employer was judge and jury, and the hearing … merely for show,” he said. The FMPR teachers have made it clear that the government intends to destroy the union with the aim of stripping teachers of a militant fighting organization so that it can proceed with its privatization plans. The teacher union leaders have made it clear that the government-boss’ intentions are to privatize public schools through the project “Schools for the 21st Century” which would establish charter schools [for the first time in Puerto Rico]. “The eleven FMPR brothers and sisters are strong, and determined to continue to occupy our positions on the Executive Committee of the Federation of Teachers, representing the teaching profession with dignity. We want it known that the anti-worker actions of the Secretary and the fascist government of Luis Fortuño will not intimidate or frighten us,” concluded the President of the Federation of Teachers.